International media is very much into politics of Pakistan and giving such stories which might bring changes in great game of Pakistani Politics. Time and again such news stories came across which give shocking revelations about current political situation. Few days back, BBC gave report that ISI wanted to cope up. Senior Pakistan Muslim League-Nawaz (PML-N) leader and Federal Minister for Environment, Mushahidullah Khan had accused former Inter-Services Intelligence (ISI) chief Lt. General (retd) Zahir ul Islam of plotting a conspiracy against the government; and military leadership to seize power during the sit-in of Pakistan Tehreek-e-Insaf (PTI) and the Pakistan Awami Tehreek (PAT) last year. On Friday, while talking to BBC Urdu, minister said the conspiracy came to fore after Intelligence Bureau (IB), a civil spy service, intercepted a telephonic conversation of the former ISI chief, who was issuing instructions to spread anarchy and to occupy the Prime Minister House. Mushahidullah went on to claim that Prime Minister Nawaz Sharif played the recording of the conversation before Chief of Army Staff (COAS) General Raheel Sharif who he said was astonished after listening to the audio tape. He further said that the COAS was surprised after listening to the tape and that he then called the ISI chief to the meeting and asked him if that was his voice. 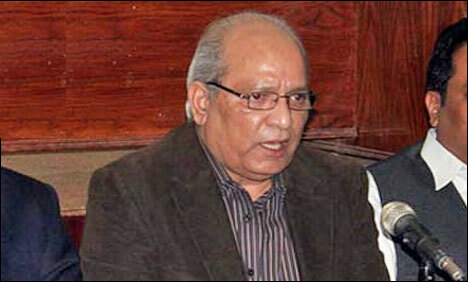 “When Zahirul Islam confirmed it, he was asked to leave,” said Senator Mushahidullah Khan. An official spokesman from the Prime Minister House denied existence of any recorded tape of former ISI Chief as alleged. Later during the day, the army’s spokesperson General Asim Bajwa also termed any reports about a “tape” as baseless rumours. But the issue got heat and made Mushahid Ullah to resign. Federal Information Minister Pervez Rasheed confirmed about the resignation. The alleged ISI plot got under discussion on all platforms, Few days back BBC reported about MQM and RAW's links caused many political hype.